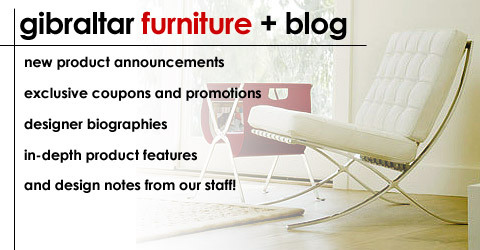 Gibraltar Furniture (www.gibraltarfurniture.com) has the Eames Dining Chair in metal for only $ 275.00! DWR sells the DCM for $429-$699. Designers and architects consider Gibraltar (800 416-3635) an insider secret weapon for blue chip merchandise at warehouse prices. This superb molded ply chair was hailed by Time Magazine as the Best Design of the 20th Century. It features a molded seat and backrest for comfort. This chair is considered a breakthrough in technology. The piece was designed using technology for molding plywood that was developed prior to, and during, The Second World War. It was entered into the Museum of Modern Art’s “Organic Furniture Competition” in 1940. The competition was set up to explore the natural evolution of furniture in response to the rapidly changing world. It was selected as the winner of the competition. Initially the designer had set out to find a solution to providing affordable, comfortable furniture that could be easily mass produced. His entries into the Organic Furniture competition were designed to have the seat and backrest joined in a singe ‘shell’. The Dining Chair Metal (DCM) was designed by Charles and Ray Eames, one of the most influential design teams of the Twentieth Century. This chair is considered a breakthrough in seating technology. The DCM continues to be an icon of Modern Design style. The superb molded plywood chair was hailed by Time Magazine as the Best Design of the 20th Century. Along with the Lounge Chair and Ottoman in leather, this may be one of the most recognized pieces in modern design history. With an expertly crafted molded plywood seat and back, this chair is extremely comfortable and built for longevity. The DCM was created in 1946. This chair is considered a breakthrough in seating technology. This piece continues to be an icon of Modern Design style. The superb molded ply chair was hailed by Time Magazine as the Best Design of the 20th Century. Along with the Lounge Chair and Ottoman in leather, this may be one of the most recognized pieces in modern design history. Low-slung, with an expertly crafted molded plywood seat and back, this chair is extremely comfortable and built for longevity. This was one of the first examples of a chair with a responsive backrest. Gibraltar Furniture offers this unlicensed reproduction for only $275! We can delivery to you your choice of White Oak, Walnut, Ebony, or Red finish. Pony Cowhide finish available on Ebony or Walnut for just $130 more. The Ebony chair will have a black and white pony cowhide selected for it. The Walnut chair will feature a hide with white and deep browns.